detachable T - head (DH) 16 valve, 4 cylinder, new for 1922 65% more power than the preceding engine. "In the world of antique cars, few names resonate like the Stutz Bearcat. Images of young gentlemen in raccoon coats racing around the countryside with a college pennant attached to the car often come to mind, and for the era, there were few cars as sought after and mythical in stature. The Stutz Company and the Bearcat model were famous from day one. Soon after completion, Harry C. Stutz sent the prototype Bearcat racer to compete in the 1911 inaugural Indianapolis 500 race. The untested car did remarkably well, finishing the race and beating many established brands, earning the Stutz the slogan "The Car That Made Good in a Day". The original production Bearcat was introduced in the Series A of 1912. The first public mention of the car (then spelled “Bear Cat” ) is in an advertisement in the 1912 program for the Indianapolis 500 mile race. This ad also was the first to use the soon to be famous Stutz slogan “The Car that made good in a day” referring to the Stutz racer’s 11th-place finish in the 1911 Indianapolis 500. The Series E of 1913 brought electric lights and starter. A six-cylinder option was available for an extra $250.00 (equivalent to $6,190 in 2017). The doorless body style lasted through 1916. A sales catalog lists the available colors for the Series E as vermillion, monitor gray, and Mercedes red. Wire wheels were listed as a $125 option (equivalent to $2,811 in 2017). The Series S Bearcat of 1917 brought the first large change to the model. While it retained the 120-inch (300 cm) wheelbase, its body now featured an enclosed cockpit with step-over sides. It continued to be right-hand drive with external gearshift and brake levers. The main change was a new Stutz-designed 360-cubic-inch (5.90 l) 16-valve four-cylinder engine. It was cast in a single block had a heat-treated nickel crank and camshafts. For 1919, the Series G was similar, but the mid-1919 Series H bodies featured cut-down sides to make cockpit entrance easier. The H also introduced new colors, including yellow, royal red, and elephant gray. By the end of 1919, price for a Bearcat had risen to $3,250 (equivalent to $45,874 in 2017, the same as the roadster and slightly less than the touring coupe). The 1920 Series K was again similar, but prices rose to $3,900 (equivalent to $47,642 in 2017) in the wake of a postwar auto sales boom. The 1921 series K featuring a new “DH” engine with a detachable head was introduced, but a switch to left-hand drive in the following KLDH (L for left) meant the end of the Bearcat, since its narrow front seat and cockpit did not leave room for centrally located gear and brake levers. By 1922, the famed Bearcat name was missing from model lists and sales literature. For 1923, the roadster was renamed the Bearcat, but the name would again disappear in 1924. The Bearcat name was reintroduced in 1931. The depression had not been kind to Stutz, so the name was used as a way to boost sales. The new Bearcat had the DV-32 (32 valve) eight-cylinder engine and each car came with an affidavit saying the car had been tested at 100 mph (160 km/h). It was a small coupe featuring dual side-mount spare tires and a rakish dip in the doors, similar to contemporary (and future) sports cars. The car lasted through 1933. The same year, the model range was enhanced by the DV-32 powered “Super Bearcat”, which offered full weather protection and higher performance. Sitting on a 116-inch (2,900 mm) wheelbase, it featured a lightweight fabric body built by Weymann. Stutz production ended in 1934. Overall, its low weight, balance, and power made it an excellent racer. In 1912, Stutz Bearcats won 25 of the 30 auto races in which they were entered. In 1915 a stock Bearcat was driven by Erwin "Cannon Ball" Baker from California to New York in eleven days, seven hours, and fifteen minutes, shattering the previous record and inspiring the later Cannonball Run race and film spin-offs. The Stutz "White Squadron" factory racing team won the 1913 and 1915 championships. Owning a Stutz Bearcat became a famous status symbol for the wealthy of the era. 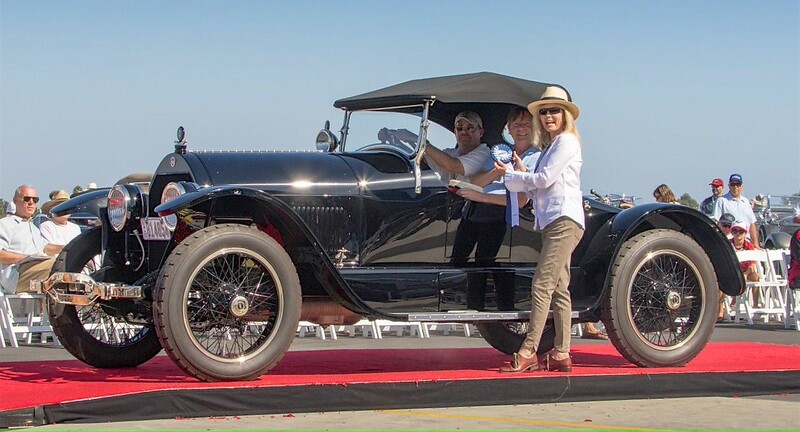 In 1914 it was priced at $2,000 (equivalent to $48,864 in 2017), almost four times that of the basic American made Model T.
The colorful history and rakish image of the Stutz Bearcat made it one of the better known antique cars to later generations of Americans. It was often associated with the "Roaring 20s" and college students of that period. It was frequently mentioned with stereotypical accoutrements of the period such as raccoon coats and illicit "bathtub gin". The Velvet Underground's 1970 song "Sweet Jane" mentions a Stutz Bearcat to illustrate the bygone times described in the song. That fame persisted well into the late 20th century and the car's name was often used by way of comparison by modern makes of cars including Nash, Triumph and Mercury. A Triumph ad asked the question "Is the TR 3 the Stutz Bearcat of the 60s?" and showed a Triumph driver, complete with raccoon coat, next to an early '20s Bearcat, in a campus setting. The Nash ad from the early 1950s has the line "For the boy who wanted a Stutz Bearcat."